Experience the Vivid Sydney Festival from a prime location aboard Kirralee cruising Sydney Harbour. See the spectacular sights and sounds and enjoy the scenic views of Sydney’s enlightened buildings and landmarks. LIGHTS, MUSIC & IDEAS. JOIN US FOR A BYO VIVID HARBOUR CRUISE ABOARD KIRRALEE !! 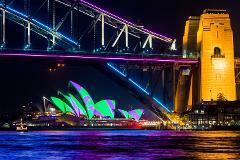 Experience the Vivid Sydney Festival from a prime location #onaboat cruising Sydney Harbour. See the spectacular sights and sounds and enjoy the scenic views of Sydney’s enlightened buildings and landmarks. An intimate catamaran cruising experience on board Kirralee to enjoy the water, see the lights and landmarks and skip the crowds. Kirralee is a spacious catamaran that can accommodate for up to 30 guests. The 10.5 metre Seawind Resort 1050 has a large internal cabin and cockpit area with easy access to the front bow area. The vessel allows for guests to sit comfortably or move with ease while cruising Sydney Harbour. Ticketed cruises run for 90 minutes (including boarding and disembarking) and depart each night throughout the festival period excluding Mondays. Cruise times are at 5:45pm and 7:30pm, with a later cruise available at 9:15pm on Thursday-Sunday evenings. Cruises will be running on the public holiday Monday 10th June. Light snacks are provided on board, including delicious sandwich and wrap platters + 1 cold nonalcoholic beverage (availability on cruises may vary). Passengers can choose to BYO alcoholic beverages. No corkage fees apply (please note no alcohol is supplied or available on board). • 90 minute BYO harbour cruise aboard Kirralee with an experienced skipper and deck hand/host. An intimate cruising experience with maximum passenger numbers of 30. •	Pick up and drop off at Towns Place Wharf. Address is 4 Towns Place, Millers Point NSW 2000. 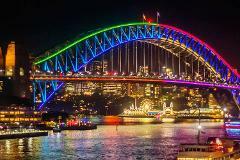 Experience the Vivid Sydney Festival from a prime location aboard Nevaeh cruising Sydney Harbour. See the spectacular sights and sounds and enjoy the scenic views of Sydney’s enlightened buildings and landmarks. LIGHTS, MUSIC & IDEAS. JOIN US FOR A BYO VIVID HARBOUR CRUISE ABOARD NEVAEH !! Experience the Vivid Sydney Festival from a prime location #onaboat cruising Sydney Harbour. See the spectacular sights and sounds and enjoy the scenic views of Sydney’s enlightened buildings and landmarks. An intimate catamaran cruising experience on board Nevaeh to enjoy the water, see the lights and landmarks and skip the crowds. • 90 minute BYO harbour cruise aboard Nevaeh with an experienced skipper and deck hand/host. An intimate cruising experience with maximum passenger numbers of 30. 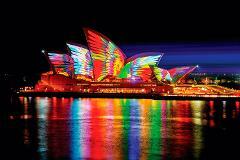 Experience the Vivid Sydney Festival from a prime location aboard Fleetwing II cruising Sydney Harbour. See the spectacular sights and sounds and enjoy the scenic views of Sydney’s enlightened buildings and landmarks. LIGHTS, MUSIC & IDEAS. JOIN US FOR AN INTIMATE VIVID HARBOUR CRUISE ON BOARD FLEETWING II !! 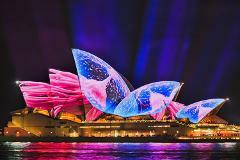 Experience the Vivid Sydney Festival from a prime location #onaboat cruising Sydney Harbour. See the spectacular sights and sounds and enjoy the scenic views of Sydney’s enlightened buildings and landmarks. Cruise on board a luxury motor catamaran (Fleetwing II) and enjoy the water, see the lights and landmarks and skip the crowds. Fleetwing II is a luxury catamaran cruiser that can accommodate for up to 46 guests. Consisting of four deck areas, the vessel has upper and lower deck spaces, a large internal cabin and easily accessible bow area. The vessel can be enjoyed in comfort in all weather conditions with large internal and covered areas on board. The vessel has modern, fresh furniture and décor throughout and there is plenty of room on board to enjoy the harbour views and Vivid lights. Ticketed cruises run for 90 minutes and depart on Thursday, Friday, Saturday and Sunday evenings throughout the festival period. Cruise times are at 6pm and 8pm, with boarding to commence 10 minutes prior to set departure times. Canapes + 1 complimentary beverage will be provided (select from beer, wine, soft drink or juice). This vessel is a licensed premise, so further drinks will be available for purchase on board. BYO is not permitted. Vivid Harbour Cruises are the perfect way to skip the city crowds and enjoy breathtaking views of Sydney and the spectacular light display! • 90 minute harbour cruise aboard Fleetwing II with an experienced skipper and crew. An intimate cruising experience with multiple deck areas and maximum passenger numbers of 45. • Canapés + 1 complimentary beverage per person will be provided (select from beer, wine, soft drink or juice). 1 complimentary beverage, with further drinks available for purchase on board. Experience the Vivid Sydney Festival from a prime location aboard Enigma X cruising Sydney Harbour on board a private motor catamaran. See the sights and enjoy the views of Sydney’s enlightened cityscape and landmarks. LIGHTS, MUSIC & IDEAS. JOIN US FOR A PRIVATE BYO VIVID HARBOUR CRUISE ABOARD ENIGMA X !! Experience the Vivid Sydney Festival from a prime location #onaboat cruising Sydney Harbour. See the spectacular sights and sounds and enjoy the views of Sydney’s enlightened cityscape and landmarks. An intimate catamaran cruising experience on board Enigma X with the luxuries of a spacious internal cabin to stay protected from the Winter chills, along with a covered aft deck, large bow area and flybridge for prime photo opportunities and viewing of the festival. Private cruises run for 2 hours (including boarding and disembarking) and can be booked on any night throughout the festival period. Cruise times are at 6pm and 8:30pm, however where possible times can be customised according to your preference. Cruises will not be running on the public holiday Monday 10th June. Light snacks are provided on board, including delicious sandwich and wrap platters + 1 cold non-alcoholic beverage (availability on cruises may vary). Passengers can choose to BYO alcoholic beverages. No corkage fees apply (please note no alcohol is supplied or available on board). Vivid Harbour Cruises are perfect to bring along the whole family and enjoy breathtaking views of Sydney and the spectacular light display, in the company of your loved ones. Enjoy the water, see the lights and skip the crowds.